Twenty years ago today, on 9 November 1992, Nokia launched the world's first commercially available GSM digital mobile phone - the Nokia 1011 - strengthening consumer interest in the world of mobile connectivity. The candybar device - which weighed a whopping 475g and could sustain a conversation for no more than 90 minutes - also introduced text messaging, viewable on the handset's two-line display. Those that rushed off to buy one were blissfully unaware of how much their handsets would evolve over the next two decades. The notion that a phone could become the central hub of their lives would have been considered outlandish. Here then are of the of the most significant milestones reached in the digital mobile era. Of course, mobile phones had been circulating long before Nokia's 1011 hit shelves, and the influx of 1980s yuppie bricks helped Motorola carve itself a large share of the market. Analogue networks Cellnet and Vodafone were the only option for nationwide mobile voice communications at that time. In 1991, however, GSM technology harmonised European mobile networks - a process that had been ongoing throughout the Thatcher years - and Vodafone soon launched Britain's initial GSM network. 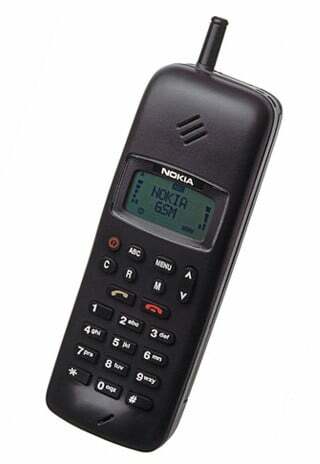 The Nokia 1011 was subsequently the first compatible handset to go into mass production. The Finish firm had produced a GSM phone for local network Radiolinja the year before, but it was an experimental device. Due to high costs and an exclusive demographic, Vodafone's limited service was used mainly by wealthy businesspeople. The real push into the broader market came in 1993 when Mercury launched its One2One network, though it initially only offered coverage in the M25 area. While its users complained they sounded on the phone like Daleks, the age of consumer mobile was truly underway and by the time Orange launched its nationwide coverage in April 1994, owning a mobile had become a tempting prospect for everyday people. It was around this time Nokia's iconic ringtone started to infect commuter lugholes, as those with the cash - £700 to be precise - snapped up the 1011's successor, the Nokia 2110. A version locked into Orange - the 2140 - followed that summer for over half the price thanks to operator subsidy. Mind you, £299 plus VAT was still a lot of money in those days. While subsequent handset releases lowered costs significantly enough to put bring mobes into a more consumer-friendly price range, the designs were dreary and offered little in the ways of fashionable allure. 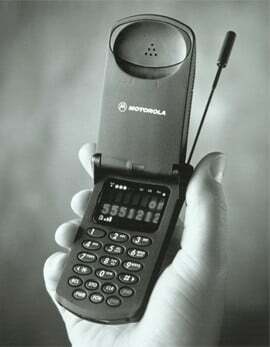 That was until Motorola launched its StarTAC handset in 1996. Sure, the StarTAC may have set punters back a whopping £1400 Sim-free, but it was the world's smallest and lightest mobile phone at the time. The following year however, One2One launched the UK's first digital PAYG service and heads started to turn. Consumers had been reluctant to sign up to lengthy contracts and a pre-paid service proved popular. 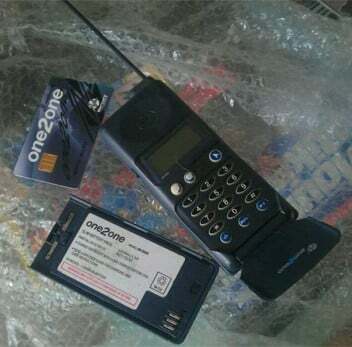 By the end of 1997 there were a trio of options - One2One's Up 2 You, Orange's Just Talk and Vodafone's Pay-As-You-Talk. Customers could now jump aboard the mobile train for roughly £180. By this point the fashionable side of our phones had taken off. Ericsson's GA628 handset was the first to offer a range of colour choice and customisation, while Siemens had a punt at a colour display with its S10 model. The latter, which only offered four hues in total, proved unpopular with consumers, though. In 1998, Nokia went a step further and launched the 5110, which captured creative hearts with its interchangeable Xpress-On cover system. More importantly, it was one of the first phones to feature the game Snake. The 5110 remains one of the most popular mobile models of all time. 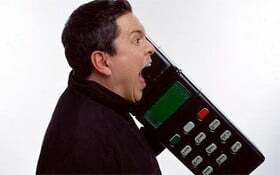 The following year, phones had dropped in price so much that the likes of Tesco offered PAYG handsets for under £50. Price wars were inevitable. 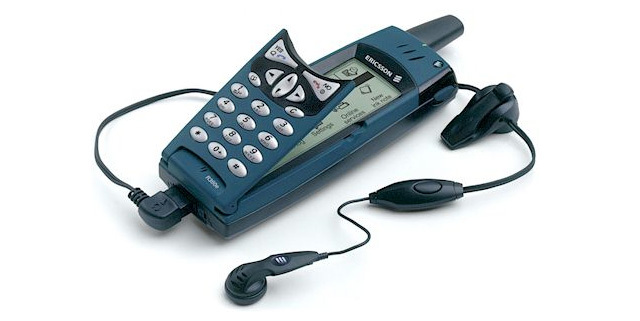 That year, Nokia touted the first WAP-enabled phone - the 7110 - as well as its popular 8210 model, which also came with a range of Xpress-On covers. Motorola, meanwhile, unveiled the world's first tri-band GSM phone - the Timeport L7089 - which meant those travelling over the pond and beyond no longer required the use of separate devices. The handset was later outclassed by the Nokia 6310i, which quickly became the business traveller's phone of choice. A new millennium was upon us and mobiles started to take centre stage. In 2000, Nokia continued its handset dominance with the consumer-friendly 3310, which added new ringtones and popularised the successful Navi Key function first seen on its predecessor a year before. Scrolling through the menu system had been made much easier as a result. BT Cellnet - which had yet to be rebranded O2 - launched the world's first GPRS network too, although enabled devices were thin on the ground. Ericsson on the other hand became the first vendor to stick Bluetooth into a phone with its tri-band and WAP-enabled handset, the T36. It also has the honour of being the first company to release a device marketed as a smartphone, the R380. The Ericsson R380 was a significant step in the evolution of our mobiles as it was one of the first phones to feature a touchscreen panel. The idea of touchscreen phones had been around for decades, first with an Apple concept landline set in 1983 and the IBM Simon nine years later, however it wasn't until the introduction of the Symbian OS alongside the R380 that manufacturers started to deem it a viable feature. Many manufacturers were instead focusing on music, photography and games to take phones beyond voice and text communications. Overseas the concept of cameraphones had really started to gather momentum at this point. The Sharp J-SH04 - available only in Japan - was the first phone to implement a snapper, pitching itself towards picture-crazy Tokyo yoof. The craze slowly crept towards the shores of Blighty, and in 2002 T-Mobile launched the UK's first mobile picture messaging service. Customers could fork out an extra £20 a month to use the feature with flashy new handset, the Sony Ericsson T68i. A separate camera attachment was necessary, though, as the phone failed to come with one built-in. 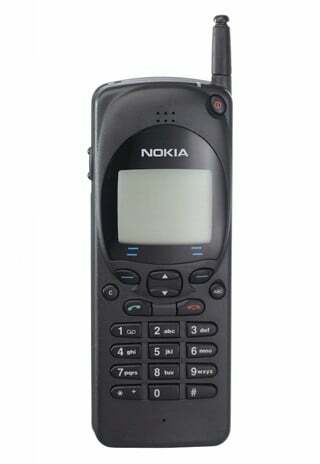 Nokia soon fixed that problem with the 7650 - the UK's first proper camera phone. With a quality of just 0.3 megapixels (640 x 480 pixels), it was useless for anything serious, but punters did start to use Europe's pricey MMS service and the Symbian OS v6.1 brings back fond memories. Snake in colour… oh yeah! Having spent a few years producing two-way pager devices, Research in Motion launched its first BlackBerry handset in 2002. Its focus on email capabilities with a built-in Qwerty keyboard proved colossally popular among the business community. Three meanwhile launched the country's first 3G service though struggled at first to get people signed up. My memories of the first phone to support it - the NEC e606 - are far from fond and after being stung by the price of Three's fresh network, I switched to Vodafone for its 'spend-a-fiver get free weekend calls' incentive… Bargain. 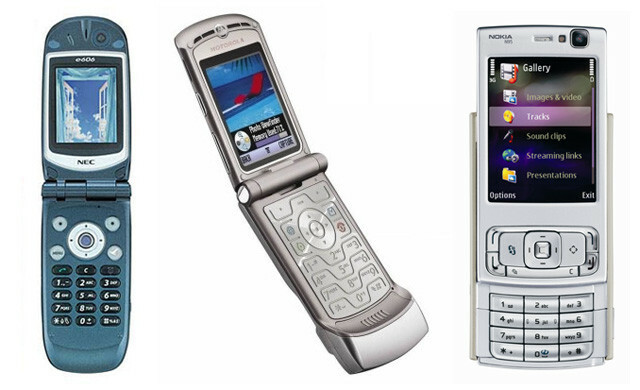 Motorola flexed its muscles in 2004 with the launch of the iconic Razr handset, which sold over 50 million units within two years, however by this time smartphones were already on the rise to dominance and even feature phones started to converge into smarter devices. I remember my boss at the time salivating over the fact the upcoming Nokia N95 had built-in Wi-Fi. Since the iPhone's introduction in 2007, we've literally seen hundreds of smarties hit the shelves, the rise and rise of Google's Android platform and of course, Microsoft's latest attempts to crack the market with Windows Phone. Nokia has struggled to retain dominance, RIM's handsets have lost their cool and our mobile devices have grown into fully-fledged computing slates. Nevertheless, according to recent research from YouGov carried out for Carphone Warehouse, a third of those over the age of 45 still use their first mobile phone, which highlights just how quickly the market has developed. 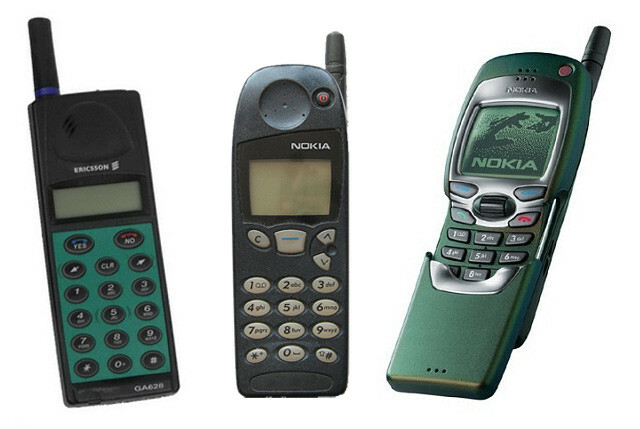 And perhaps how well-built the handsets of yesteryear, like the Nokia 1011, were. It's hard to believe things have changed this dramatically in half a decade and it'll be more than interesting to see where we're at in another five years.